The minutes of the Barnet BoroughWatch AGM held on 9th December 09 can be downloaded here. Offences continue to be widely dispersed across the borough with high levels of offences around HA8; as well as EN4/N20. The south of the borough has also suffered higher numbers of offences, particularly around Cricklewood Lane j/w Finchley Road. Current peak hours are 1200-2000 hours. Offences around East Barnet tend to peak in day time between 1300-1800 hours). Increase in offences around Friern Barnet Lane/Oakleigh Road and around Green Way (Totteridge Ward). The Leicester Road/New Barnet area has seen a reduction in the number of offences. The majority of burglary offences in HA8 - Edgware/Burnt Oak are overnight 2300-0400 hours. Clusters of offences occur around Montrose Avenue and streets off the A41. Burglary in the south of the borough has seen an increase in offences around Childs Hill, Golders Green and West Hendon, while levels remain high around Finchley Church End. Offences peak around 1700 hours. By far the majority of offences occur near major through roads such as the A41, A1, A406 etc. A timely warning from Enfield police of problems very near to us in Oakleigh Ward. The last couple of nights has seen four burglaries being committed on Cockfosters Ward from Hadley Wood down to Oakwood. Each has had the same M.O - someone completely removing a pane of glass from a downstairs window in order to gain entry. However, two suspects were arrested last night for a similar offence with the same M.O. It is yet to be established if the two arrested are responsible for all the burglaries. The purpose of this message is to keep you informed and to ask you remain vigilant. A Guide To Home Security is an excellent publication available on the Home Office web site. Click here to go to the download page. The BoroughWatch AGM is on Wednesday 9th December at 7:30 pm for 8:00 pm at The Hendon Campus of Middlesex University, entrance in Greyhound Hill, Hendon – see map. This is a summary of many of the points discussed at the recent High Barnet Community Action Panel meeting. As it is a neighbouring ward with a common boundary along Station Road many of their concerns also affect Oakleigh Ward. There have been further incidences of eggs being thrown in the High Street at night time, 10.30pm – cctv has captured a black /dark blue 2 door smart car driving southbound along the high street. Unable to obtain registration number of the car. Please inform local residents etc and if anyone is able to get a registration number please inform Barnet SNT. Burglaries are up at the moment, please make sure that car keys are not left just inside the front door, as rods are being used to retrieve and take cars. Report any suspicious activity/people etc direct to the police 999. At the last meeting, one of the priorities set for the High Barnet Safer Neighbourhood team was to try to lobby the Council to delegate certain powers from the Council to the Safer neighbourhood teams e.g. dog fouling, litter and smoking in public places, and minor traffic offences. At the moment, the enforcement of warnings, fines etc is solely down to the council, and it appears that there are no enforcement officers at the council to actually carry out these enforcements. You may have seen the front page article relating to this in the local newspaper, together with letters published in the papers. The SNT, who are out on the streets daily and see and hear what is going on, are willing to take over these powers (which no one is implementing at the moment), but the council wont delegate these powers, for some bizarre reason. There appears not to be any actual enforcement officers in the council that can ticket offenders, and so blatant offenders are getting away with breaking the law. The police/PCSO’s meanwhile may see these offences right in front of their eyes, but can do nothing about them!! Other Boroughs appear to have delegated powers, why not here? Another priority set at the last meeting is for the SNT to be given use of a motor vehicle in order to carry out their duties effectively. At the moment the team have no car, so they are unable to attend problems if anything is happening any distance from where they are at the time (potentially 6 miles from one end of the ward to the other). They have had use of a car for the last 4 years, and suddenly it is taken away from them. Yes, we understand they are to be on foot patrol, but at the same time, they cannot effectively cover the ward on foot, and as residents have become used to being able to telephone the team direct and request help, they have been able to deal with situations, arrests etc. Now the SNT will no longer be able to deal with these matters effectively. I have been told that we cannot have the use of motor vehicle as a priority, but from what I understand, it is up to the residents who form the CAP to set the priorities, and if this is your priority we need to reiterate this to the Police. Finally despite managing to get barnet police station open continuously during the day – it has now reverted to being closed between 10-11am and 6-7pm! Despite all our efforts to keep it open, it didn’t last long! However at the moment it is open 24 hours as the custody suites are being used in addition to Colindale, but this is only for a few weeks. An elderly resident received a phone call from someone purporting to be a Police Officer. The resident was told that the police were investigating a credit card crime and needed her credit card for finger printing. She was asked to leave the card in a envelope in her letter box and 'undercover officers' would collect it. When she questioned this, the 'officer' was abrupt with her suggesting her questions were delaying an investigation and that she should just do as asked ASAP. The elderly lady did do as asked and shortly after, the envelope & credit card was collected. She soon received a call from the same person thanking her for her cooperation. Another phone call, this time from 'Barclays Bank' stating there had been some unusual spending on her card and the bank had cancelled it. The thieves then spent the rest of the evening spending the victims money at leisure! This is being investigated, however, I pass on this 'scam' or M.O so that you, your family and neighbours are alerted to it's existence. Barnet police have charged two men aged 16 and 21 from Archway on suspicion of burglary after a swift response to a 999 call. On Monday 5 October 2009 at 0147 hours Barnet police received a call from a woman who was at home with her child stating that she could hear voices downstairs. She told officers that she could see the suspects passing her television through an open downstairs window and loading it into their car. Units responded swiftly, and upon arrival found one man fleeing the scene in a previously stolen Mercedes A class, which he crashed, while another two men made off in an Audi A4 stolen from the property, which was used to ram a police car to escape. The officers arrested the driver of the Mercedes on the site while other officers engaged in a lengthy pursuit of the other car into Harringey borough. The two men left the vehicle and one of them was found and arrested after a search of Highgate cemetery. DI John Cracknell said "We treat burglary very seriously on this borough and to arrest two suspects through swift action is a really positive result. Much of the victim's property has been recovered unharmed and with further enquiries we hope to find out the identity of the third suspect. I am also very pleased that no one was injured by the dangerous and criminal actions of these three men in which a police vehicle has been taken out of service and two stolen vehicles have been severely damaged. Barnet police wants to help residents protect their own homes by making sure their premises always look occupied through the use of timed lights and/or radios and that all windows and doors are kept secured when you are either out or asleep." Barnet Police are warning the public about a new con trick that has been reported to them in the last 48 hours. Thieves are attempting to gain your bank and credit card details by phoning Barnet residents and stating that they are police. A story is then told that they have been informed by the residents’ bank that there has been fraudulent activity on their account and that their bank card and pin details should be handed over to a police officer who will be attending your address later on their behalf. This is all a lie. This is an elaborate hoax to steal from you and should be reported to the police. Barnet Police do not ask for bank cards and we will always be able to produce identification when in uniform and in plain clothes. We would recommend that you ring a landline number for police that you have obtained from the phonebook or use 0300 123 1212, our new non emergency number, or 999 in an emergency to contact us. Barnet Police are fully investigating the four crimes reported to them and are reminding residents that you should never disclose your pin number. No one including your own bank will ever ask you for this number. Also there is no need for you to give your bank card to another person to take away with them. Your PIN is to be kept secret and never disclosed to anybody else. Always when entering your PIN ensure that no one can see the key pad. It is best to cover your typing hand with the other to block any view for potential thieves. If you know anything that could assist police in identifying those involved in this crime in Barnet, call 020 8733 5033 or Crimestoppers anonymously on 0800 555111. On 18th September, 2009 the Barnet Planning Case Officer, Josleen Chug, refused a third application (B/02592/09) to demolish 15 Oakleigh Park North and replace it with a block of five flats. We will have to wait to see if the applicant appeals but, meanwhile, thanks to the 107 neighbours who objected to this planning application and to Theresa Villiers MP for lending her support. * The proposed development by reason of its size, mass, bulk, design and siting would be a dominant and obtrusive addition to the street out of keeping with the scale of development in the locality harmful to the character and appearance of the street scene and general locality contrary to policies GBEnv1, GBEnv2, D1, D2 and H16 of the Barnet Unitary Development Plan (2006). * The plans accompanying this application are:- Design and Access Statement 7403, PS01, PS02, PS03, Report on the impact on trees of proposals for development by John Cromar and accompanying drawings (TC/1-38-2367/P1, TC/1-38-2368/P2, TC/1-38-2367/P3, TC/1-38-2367/P4, 7403/OS, 7403 01, 7403 02, 7403 03, 7403 11, 7403 12A, 7403 13, 7403 14, 7403 15, 7403 16, 7403 17. * The proposal will result in loss of some trees of special amenity value contrary to policies GBEnv1, GBEnv4, D12 and D13 of the Barnet Unitary Development Plan (2006). * Inadequate information has been submitted in respect of the impact of the proposed works and development on the trees of special amenity value, protected by Tree Preservation Order at the front and rear of the site; the local planning authority is therefore unable to properly assess its impact. In the absence of detailed information it is considered that the proposed development could result in the loss of trees of special amenity value in these locations contrary to policies GBEnv1, GBEnv4, D12 and D13 of the Barnet Unitary Development Plan (2006). * The proposed development does not include a formal undertaking to meet extra education, health and libraries services costs together with associated monitoring costs arising as a result of the development, contrary to policies CS2, CS8 and IMP2 of the Barnet Unitary Development Plan (2006), Supplementary Planning Document - Planning Obligations, Supplementary Planning Document - Contributions to Education, Supplementary Planning Documents - Contributions to Health Facilities and Supplementary Planning Document - Contributions to Libraries. You may recall that Aaron Gershfield, one of the applicants to develop 15 Oakleigh Park North, was charged by the U.S. Federal Trade Commission and the State of Nevada with using unfair and deceptive collection tactics in his payday loan companies. As a result a group of Internet payday lending companies that allegedly threatened customers who didn't make payments with arrest and called customers at work and swore at them has agreed to pay US$1 million to settle charges from the U.S. Federal Trade Commission and the State of Nevada. If you had problems printing the Safer Neighbourhood Teams contact sheet posted last Tuesday, here's a PDF version. To open and print it you'll need Adobe Reader, which should already be on your PC but if it isn't, download Adobe Reader here. Please click here to download the latest Safer Neighbourhood Teams contact sheet. The Metropolitan Police Authority (MPA) is consulting on London's policing priorities and are interested in your opinion. Please tell them your views by completing this short questionnaire. If you require a paper copy call 020 7202 0063 and leave your name and address, or if you require a telephone questionnaire leave your name and telephone number and somebody will call you back. The consultation closes on 30th November 2009. The MPA look forward to hearing your views on policing in London. Barnet Planning's letter informing neighbours about planning application B/02592/09 to demolish 15 Oakleigh Park North and replace it with a block of flats said that objections must be received by 25th August. However, Barnet Planning have placed a notice on the lamp post opposite 15 Oakleigh Park North which says: "Please send your comments in writing before 27 August. Replies received after 27 August may not be taken into account". So if you have only just got back from holiday and have not yet had time to comment, please consider submitting an objection to arrive no later than 27 August, 2009. To date Barnet Planning have acknowledged receipt of only 20 objections, which is no doubt due to so many neighbours being away on holiday. Even if you have objected, please consider asking your spouse to submit a separate objection. For full details of the application and a sample objection letter, please refer to the post below this one dated Monday, 17 August. Your urgent action is requested to oppose the demolition of 15 Oakleigh Park North and its replacement with a block of five flats on four levels. If this planning application is accepted it will set a precedent for the building of blocks of flats on the Oakleigh Park estate. Your objection must be submitted to be received by Monday 24th August. 1. Please download an objection letter here then print, sign and post it by Friday, 21st August. 2. Alternatively, please compose your own letter, which will carry much more weight. Download suitable content here. 3. Also, please consider writing to Theresa Villiers MP and Councillor Marina Yannakoudakis. Thank you for your support, which is much appreciated. The hearing to decide the iBar application for a late licence takes place on Monday, 17th August at 2pm at the Town Hall, The Burroughs, Hendon. Many people have objected including the Police, Councillors and Theresa Villiers MP. However, if you are able to attend the hearing your presence will help demonstrate to the licensing committee the strong local feeling against this application. Objections to planning application B/02592/09, to demolish 15 Oakleigh Park North and replace it with a block of five apartments on four levels with basement parking, must be submitted by 25th August. You'll recall that the last time these applicants applied, they did so over the Xmas holidays. This time they have applied when they know many likely objectors will be on holiday. Please consider sending an email or letter to Planning Office Josleen Chug requesting her to consider an extension to the consultation period so that all those with an interest may make their views known. The more of us who make a request, the more likely it is to be granted. Some of you will have received Barnet Planning's letter dated 28th July about planning application B/02592/09 to demolish 15 Oakleigh Park North and replace it with a 2-storey building comprising five apartments on three levels plus basement parking. Comments and objections need to be submitted by 25th August. Police and Trading Standards Officers are advising the public not to reply to bogus adverts placed in local and national press by a company claiming to sell high value electrical goods at reduced prices. Customers who have attempted to buy goods from the advert have been asked to pay or transfer cash into a bank account. They are told that the items will be sent to them only to find that the purchases never arrive. The adverts have been placed in local papers and magazines nationwide under a variety of names including Arash Ltd, The Gadget Company, Gadget Limited, Office Bits Warehouse, Office Supplies Cabin and Office Brands Megastore. The only contact details are telephone and fax numbers and occasionally an email address that is based on the URL @easymailorders.com. Another aspect of the scam is that cards from company’s calling themselves ‘Parcel Express UK’ and ‘Network Link Couriers’ are posted through random front doors telling the householder that they have missed delivery of a parcel. It asks the recipient to phone a number and pay for a customs charge of the product by credit or debit card. Once this is done the parcel fails to arrive. Although money is not debited from the victims’ account, the card details are later used fraudulently. Parcel Express UK and Network Link Couriers are not legitimate companies. As a matter of course unless you are confident of the legitimacy of the company contacting you then do not provide your card or bank details to organisations or people not known to you. If you have placed an order in response to one of the newspaper adverts concerned, or called ‘Parcel Express UK’ or ‘Network link Couriers’, you should inform your bank immediately and cancel your card. "The City of London Police Economic Crime Directorate is working closely with Westminster Trading Standards Office and the Metropolitan Police to identify those responsible for this fraud. We are at an early stage, however it is evident victims have been duped by bogus advertisements for reduced price goods, placed in trusted newspapers and national magazines. Our advice to people is this: only ever part with your financial details to a known and trusted company. Likewise if an approach for delivery of a parcel is unexpected or unsolicited, be wary, question the reasons why and take time out to consider the validity of the request. Trading Standards or Consumer Direct can offer advice." If you suspect you have been a victim of this crime please report it to the City of London Police at ophukka@cityoflondon.police.uk or phone their fraud line on 020 7601 6999 or contact Consumer Direct on 08454 04 05 06. Due to errors in the advertisement of the variation application for the above premises the period in which representations for or against the application may be made has been extended. This means, whilst your representation still stands, further representation may be accepted up until the 21st July 2009. To permit the sale of alcohol, the exhibition of films, the performance of live music, the playing of recorded music, Karaoke and the provision of facilities for dancing from 10:00hrs until 02:00hrs the following morning on Mondays to Sundays. To permit late night refreshment Monday to Sunday 23:00hrs until 02:00hrs the following morning. An additional thirty minutes drinking up time on top of the last permitted sale of alcohol. Should you have any questions or queries with regards this or any other matter regarding the application or hearing process please do not hesitate to contact me. A guy calls up saying he's from BT. The bill needs paying and he will cut you off if you don't pay up now. Says if you don't believe him, he will suspend your line now and try calling out in 15 seconds. If you don't pay up, it will cost £75 and you will have to have a new number. If you say you're on direct debit, he says it failed and they have written to you three times as a warning. If someone calls into your line, you cannot make calls out until they hang up. Anyone can do it and they can leave your line blocked for hours if they forget to hang up the extension. It's been like that in the UK for ever. BT don't do this. If they are going to do something like this, they divert all outgoing calls to their billing office, where they then sort it all out. BT won't change you number out of spite, only if you want it changed or you are getting funny phone calls or at the request of the Police with the subscribers consent. In any event, do not give any personal or financial details over the phone. Here's another Rogue trader alert. Two men calling themselves Tree and Garden Care have been active in the EN5 area of Barnet using two phone numbers: 01582 760623 and 07958 273441. Sorry about the scant details but, if you get one of their leaflets or they cold call, do not engage them in any work. If they do anything without your permission, harass or threaten you, call the Police on 999. The iBar, previously The Real Music Club and The Bull & Butcher pub situated in the High Road next to Boots, has applied to Barnet Council for a club style venue licence for alcohol, music, live bands, dancing, etc. with a terminal hour for the premises to be cleared of 2:30 am extended to 3 am on Fridays, Saturdays and Sundays with premises closing at 4 am. If such a licence is granted there may be a high risk of anti social behaviour and nuisance from the effects of intoxication leading to a possibly increased risk of crime and disorder including drink and drug related offences which may threaten public safety. Download an example letter of objection here and read Barnet Council's licensing policy here. The false courier note has come back again. This time to 4 victims in Edgware that we know about. 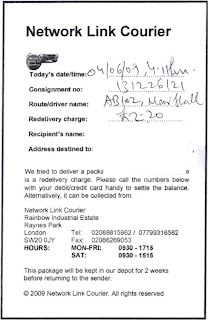 The note, which is posted through the door is on behalf of "NETWORK LINK COURIERS" of SW20, tells you that they tried to deliver a package whilst you were out and that to receive it you must pay a small fee of £2.20 on your credit card. But if you phone the number you will be charged many hundreds of pounds!!! Needless to say the address is false. I've attached a pdf of the note but of course we have removed the victims details. Click on it to enlarge. If you get one of these do not reply or contact the company but inform the police on 020 8200 1212. This newsletter is to keep you informed updated with some of the latest events on the Oakleigh Ward. At the end of April two members of the team witnessed a local off license selling alcohol to a group of youths. On being challenged by officers, police found that two of them were if fact only 14 years old. Subsequently the owner of the off license received a Fixed Penalty Notice and has been reported for the offence. This is the second time in just over a year and on that occasion the youngest person was 15 years of age. This has been taken to our licensing team and they are going meeting with the council and review the off licenses liquor license. Recently the ward was once again visited by artifice burglars. On one of the occasion a man posing as a window cleaner, conned his way into the house of a 94 year old male. The male did have window cleaning equipment with him. After persuading the man to have his rear windows cleaned the resident went into another room whilst the work was apparently completed the window cleaner even came into to show the resident the dirty cloth he had used. When he left the elderly resident found that money has been taken from a room at the back of the house. The second incident has a completely different MO, A male knocked on the door of a 92 year old woman stated that he was from the council and was checking on her decorations. He flashed an ID card at the resident, but she was unable to see what was on the card. He entered the flat and struck up general conversation about potential work that might need to be done, he went in and out of different rooms in the flat and then was asked to leave by the resident as her carer was about to arrive. After the suspect left she noticed a few things had been moved. Growing concerned check other rooms and found that cupboards and draws had been open and things thrown about. She that checked her purse and found money missing. We would like everyone to remain extremely vigilant as there is always a risk from these perpetrators. Both of the Victims have been visited by the Safer Neighbourhood Team and all residents in these roads have received bogus caller leaflets. On the whole over the last month car crime has remained low with only 10 offences. Primarily these offences are where number plates have been taken; we believe that the suspects are using them for avoiding the congestion charge and speed cameras and to avoid other such traffic prosecutions. At the end of April the Oakleigh Team came into the knowledge that a very prolific thief has just been released from prison. Given past experience his is extremely likely to re-offend. The team have made 3 arrests for Actually Bodily Harm and one for robbery. If you are contacted by someone calling themselves James Stewart (not the actor or pretender to the throne) who claims to work for a home insulation company in Barnet, please contact me ASAP. Barnet Borough Police are holding a public meeting with a difference at Barnet Football Club, Priory Grove, Underhill next Tuesday, 2nd June at 7pm. The Borough Commander is hoping to attend and chair the meeting in order to answer your questions about policing and crime matters that concern you in Barnet and explain the Policing Pledge and what it means in Barnet. Please come along and participate in order to help us ensure that you receive the service you expect from your Local Police. You, your friends and your neighbours are welcome so please distribute this message to them. Please click here to go to the online interactive survey. This survey is completely anonymous. We only require to know which borough you live or work in. We do ask your demographic data but this is to ensure we are consulting with all members of the population. This data will be kept strictly in confidence. The survey will need to be completed by FRIDAY 19th JUNE 2009. We appreciate your help with this survey and value your comments. Visit the Safer Neighbourhoods website for more information about local policing. I spoke to Paul Hammond at Colindale this morning and he advised me that there is a large increase in artifice burglaries, mostly the culprits are following the common tactic of alleging they are from one of the utility companies (electricity, gas or water) and the Finchley area was badly hit last weekend. However, a new tactic has also emerged, a few people have had water thrown over them and when they return home to change they have been followed by a female who has knocked on their door, she claims to have witnessed the incident and encourages them to change but while they do so she relieves them of as many valuables as she can and disappears. Please warn all your friends and neighbours, particularly the older folks who are more likely to react adversely to this sort of shock. There has also been a large increase in the number of high value cars stolen from driveways, if possible keep cars in the garage and keep both car and garage locked. The thieves do not seem to be deterred by alarms on cars or houses, if they can see keys left on hall tables. If you see anyone loitering near cars or on driveways, do not hesitate, dial 999. The trading watchdog today warned people to be vigilant about scams which cost the public around £3.5 billion a year. The Office of Fair Trading said three million consumers become the victims of mass marketed scams each year, under which fraudsters use methods such as mailings, email, the internet, telephone and text message to recruit victims. More than 7,000 scams were reported last year, the most common of which were deceptive prize draws and sweepstakes, followed by bogus foreign lotteries. Under both of these scams, victims are told they have won a large sum of money but are asked to hand over cash to pay for fees or taxes before they receive their prize, which never arrives. The third most common scam was advance fee fraud under which people are asked for help transferring money from overseas and they are promised a chunk of the cash if they pay the fees involved. This was followed by frauds relating to homeworking and business opportunities and property and land investment scams. The figures were released at the beginning of the OFT's Scams Awareness Month, which marks the launch of a campaign with 90 Trading Standards Service across the country. The OFT called on consumers to drop off any scam mailings they receive in designated 'Scamnesty' bins at local libraries and other public areas across the country. The information was used to help the OFT and its enforcement partners identify and develop strategies to combat the worst frauds. In a similar campaign in 2008, the OFT collected more than 15,000 mailings. The campaign is being backed by television presenter Angela Rippon, who also features in a new DVD being launched by the OFT, highlighting common scams and setting out how vulnerable groups, such as the elderly, can be protected. Ms Rippon said: "Scammers use psychological techniques to gain vulnerable people's trust. They exploit fear and insecurity to steal as much money as they can from those who can least afford it. "Though anyone can fall victim to a scam it is always the oldest that are hit the hardest." John Fingleton, OFT chief executive, said: "Scammers are sophisticated at targeting people who are often the most vulnerable in society. As we enter tougher economic times it is more important than ever for people to be alert to prevent themselves, or friends, families and neighbours from falling victim to these heartless money-making schemes." This newsletter from the Metroplitan Police is to keep you informed and updated with some of the latest events on the Oakleigh Ward. The newsletter will be published and distributed at the beginning of every month. Following a recent spate of burglaries an observant resident spotted two males loitering in the road using their mobile phones, they then both left; one on a motorcycle and the other in a car. The resident managed to write down the registration of both vehicles, the team took this information on board and increased patrols to deter any further burglaries in the area that had become a hot spot. During these increased patrols members of the team spotted the motorcycle the next day, checks were made and it was found that the keeper lived in Devon and was still in possession of his bike, this indicated that the motorcycle was bearing false number plates. The Team again saw the motorcycle parked and have seized it for forensic examination and confirmed that it was stolen in 2007. We now await the forensic report. Although this seems to have removed one burglar there are others active in the area, particularly between 3.00 and 6.00 p.m. Please advise neighbours to be vigilant at these times. The team have successfully signed up two youths on the ward with Acceptable Behaviour Contracts (ABC). They came to the attention of the Safer Neighbourhood Team on several occasions due to their antisocial behaviour. The purpose of the ABC’s is to form a contract with the youths for them to adhere to. If they fail to meet the requirements of the contracts the next step would be to issue an Antisocial Behaviour Order (ASBO). This has been done working in Partnership with the London Borough of Barnet and the Metropolitan Housing Trust. On 26th March 2009 the ward was visited by a group of artifice burglars. On this occasion two men entered a block of retirement flats posing as security men. They entered a flat via an open door and spoke to the 96 year old occupant, they told her that there had been a burglary and asked her if she would check her belongings. They also asked her if she had a safe, which she showed them. One of the men then distracted her whilst the other removed property from her flat. There have not been any other incidents like this on the ward, but we would like everyone to remain extremely vigilant, as there is always a risk from these villains. • 24 Stop & Accounts and 1 Fixed Penalty Notice for driving whilst using a mobile Phone. This warning is brought to you by the East Barnet Safer Neighbour Team and Barnet Trading Standards. Be on the look out for a firm of block pavers called "Driveway Specialists". Their company name is "P&J Contractors". They used aggressive tactics against a young family in High Barnet demanding £2,500 for a very poor quality job. They have 0800 and 0845 numbers displayed, neither of which are in use. If spotted call police on 999. We had a lovely 89 yrs old chap in this morning who reported that yesterday he was met in the street in East Barnet by a very plausible chap pretending to know him. He shook his hand and greeted him like a long lost friend before following him home and mentioning about cleaning his windows. Once at home another male joined them and between them suggested that repair work needed to be carried out to the window frames and the roof. They disappeared out of sight for a brief time and then reappeared claiming £40 for cleaning the windows plus £200 for the repairs. The gentlemen stated that they did no work whatsoever. As it happened he managed to palm them off by stating he did not hold money or a cheque book and would have to get his nephew to come along to bring the money. Strangely they "ummed and ar'd then left". Two white males: one in his mid 20's and the other early 30's. Both athletic build, height 5' 08'' to 5' 10". No distinguishable accent or anything else (the informant has difficulty with his eyesight). If you hear of this or anything similar please call 999.